Treat yourself to a private Rainbow Warrior Awaken! divination/healing and reading with Trinity Harris, one of the co-creators of this beautiful and potent deck. We begin within the stillness of sacred space and I will assist you in coming to the question or intention that most burns in your heart. Then, using a unique method of pulling cards, we will open to the guidance, wisdom and healing of Rainbow Warrior Awaken! as well as opening into intuition, presence and a range of energetic healing tools that will help bring clearing to that which blocks your intention, opening you into clarity, peace and soul nourishing insight. See below to buy your own deck. Together with artist Mara Berendt Friedman, Trinity Harris has co-created the divination deck Rainbow Warrior Awaken! Your Journey of Guidance and Healing. Rainbow Warrior Awaken! 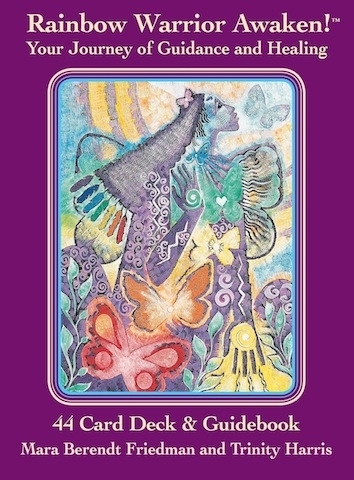 Your Journey of Guidance and Healing, is an inspiring blend of beauty and wisdom. This deep expression of divination flows from the power of the Sacred Feminine. 44 color cards & a 96 page guidebook feature the exquisite paintings of internationally recognized artist Mara Berendt Friedman. Friedman has joined with energy therapist and counselor Trinity Harris to create simple yet potent messages that weave together practical and spiritual insight with powerful meditations, healing processes and a unique method of choosing cards. Harris offers a poem for each card, illuminating it’s message. Published in November of 2010, a new 5th edition of Rainbow Warrior Awaken has just been released in August 2016. It has a new beautiful box and a lower price. Appropriate for women and men of all ages, Rainbow Warrior Awaken! speaks to the Truth within the heart of us all. Rainbow Warrior Awaken! is available through New Moon Visions. Cost is $29.95 - For more info or to order click here for New Moon Visions. You will be taken away from the Radiant Life Center website.